The Robinsons Fell Hard for the Swiss Hasliberg, and We Have the Photos to Prove It! Meet the Robinsons. Paul and Eleanor recently traveled to Switzerland with us, spending two weeks on the Swiss Heartland Untour. “We have been on other structured tours in Europe. They have been great, but this one was super great. Why? We could check the weather and determine what we wanted to do. We could attend a concert we just heard about and could work it into our schedule. We could take a morning ‘off’ the last week just to catch up on journals. We could sleep later some mornings and still get a bus quickly to Brunig and onto the trains for our day’s adventure. We could fix our own food. The Robinsons fell in love with the Swiss Untour, and here are their pictures to prove it. 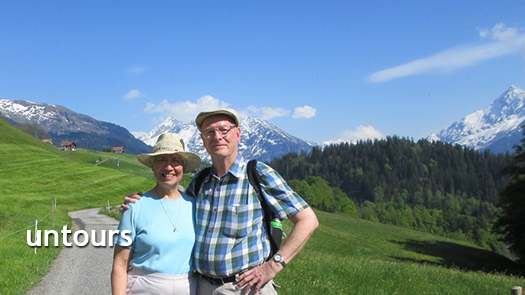 The Robinsons stayed in the Hasliberg and loved the atmosphere of the small villages, grassy meadows, and pristine lakes they found in the rural setting of the Swiss Heartland. The Robinsons enjoyed scoping out Alpine peaks and photographing some of their most dramatic views, like the Wetterhorn photographed here. The Robinsons toured with their friends, the Findleys. Here they all are together in front of the lion memorial of Luzern, one of the city’s most beloved landmarks. This moving carving is a memorial for the Swiss guards who were killed during the French Revolution. The Robinsons and their friends stayed together comfortably in our Kuenzler 2 chalet, which provided them a lovely respite for their down time between train trips, boat rides, and hikes. This chalet is in the sweet little mountainside village of Hohfluh. When you are staying in the high altitudes of the Swiss Alps, you should be prepared for a sudden turn in the weather, or a mild spring snow. While not common during our season, it is not unheard of. Fortunately the interior of the Kuenzler 2 is cozy and dry, with nice views and a sunny balcony. Notice the laundry hanging out to dry. You can see the sun prevailed. Long live Switzerland and the Swiss Heartland Untour. Check out all of our offerings in Switzerland here.